A daily reader of prayer and meditation in serving the practice of lectio divina or divine reading based on the twelve chapters of Christian McEwen's 2011 book called World Enough Time: On Creativity and Slowing Down. Focusing in turn on different subjects, each month introduces a new subject ranging from the art of slowing down, considering good company and conversation, investigating child time, to the joys and relaxation to be found in walking. Those who are familiar with Christian's original text will recognize many of the entries, which have been arranged so as to flow smoothly from one to the next, helping to deepen and clarify each particular theme. The title is drawn, with laughing gratitude, from Lewis Carroll (see the epigraph, above), though it has more ancient origins too. 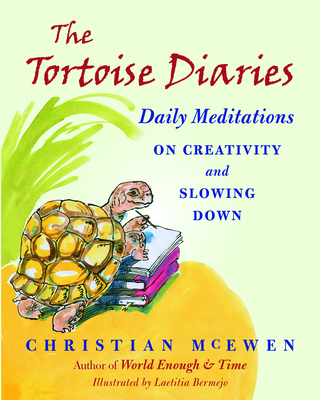 In The Tortoise Diaries, Christian McEwen gives her readers beautiful insight of how slowness can open doors to sustained creativity. CHRISTIAN MCEWEN was born in London and grew up in the Borders of Scotland. Her most recent book, also with Bauhan Publishing, World Enough & Time: On Creativity and Slowing Down is in its fifth printing. In addition, she has edited four anthologies, including Naming the Waves: Contemporary Lesbian Poetry, and Jo's Girls: Tomboy Tales of High Adventure, True Grit & Real Life. She has written for the Nation and the Village Voice, and her poems and essays have been widely published. McEwen has taught poetry, environmental literature and creative writing at a number of different venues, including The Scottish Poetry Library in Edinburgh, Williams College, Smith College, and Lesley University. She has been a fellow, several times, at the Yaddo and MacDowell colonies, and lives in Northampton, Massachusetts. LAETITIA BERMEJO is an artist and illustrator who lives in Mallorca.